The daily chart of the Ten Year notes has formed a long line (low ADX on the Dailies). 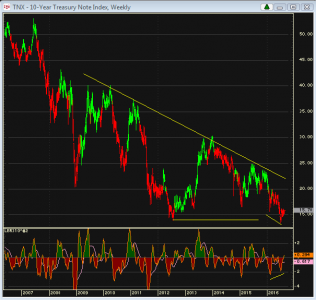 The weekly chart of the ten year yields is a bit more interesting, though, showing a double bottom as well as a momentum divergence. Weekly charts can take a long time to unfold! Ten year yields back above 1.6% would be the initial breakout level.